The lead hook is laser-engraved with the personalised married name and then features "His" and "Hers" above each hook. Personalise the key hook with any married name. Please provide the required personalisation text in the box provided, entering it exactly as you would like it to appear on the product e.g. 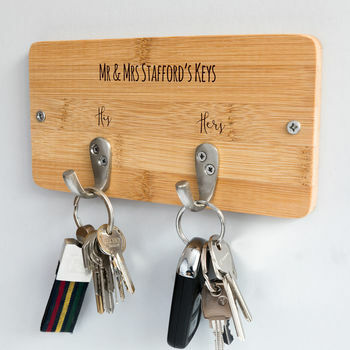 "Mr & Mrs Stafford's Keys".